What makes these muffins so moist is to choose very ripe bananas. 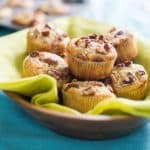 If the bananas are mottled and overripe, then that's even better because they'll add flavor, sweetness and moistness to the muffins. Don't assume that brusied looking bananas are ripe because they can still be firm on the inside. Check for bananas that are super ripe to the touch and smell. 1/2 cup (113g) unsalted Butter, at room temp. Preheat oven to 350° F. Line a standard-size muffin pan with paper liners or spray with non-stick cooking spray and set aside. Whisk together by hand the flour, baking powder, and salt until well combined, about 20 seconds. Set aside. In a mixer fit with the beater blade, cream together the butter and sugar until light and fluffy, about 2 minutes. Beat in the bananas until well broken up. Beat in the eggs and vanilla extract. By hand, fold in the flour mixture until just combined. Fold in the nuts, reserving a handful to top the muffins with. Fill the muffin cups with the batter. Top with the reserved nuts. Bake for 25-30 minutes or until golden and a toothpick comes out clean from the center. Let cool for about 10 minutes then remove the muffins and finish cooling on a wire rack.